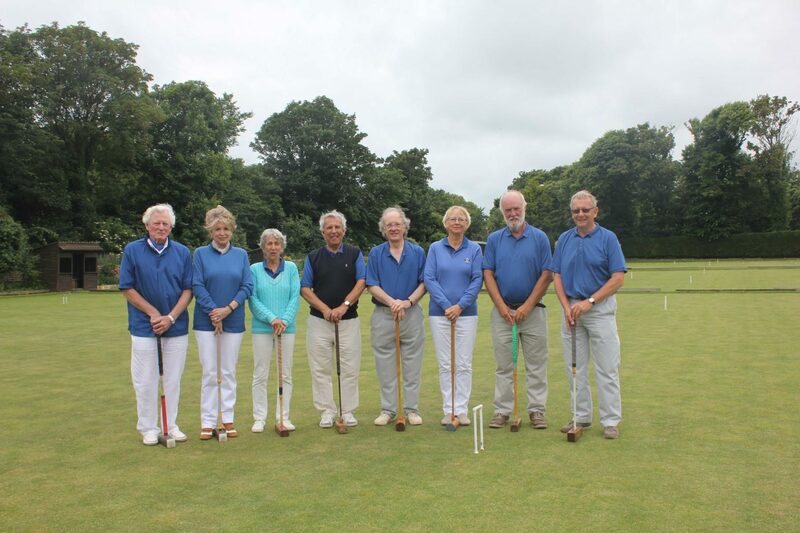 A group of eight represented Horners at the inaugural Glovers Tournament. After a welcome drink those of us who had not played before were given a half hour lesson on the basic rules and tactics of Golf Croquet. It was mentioned in the presentation that we should not try too many trick shots, as per the more experienced players, as the National Golf Croquet Open tournament was due to take place the next week and they would not have time to relay the lawns if we caused too much damage! dispelling the obvious notion that he must have found it in the back of his wardrobe. However as can be seen from the photograph the Horners were way ahead of all the other livery companies in terms of dress. At the end of the morning session Geoffrey and Denis were unbeaten whereas Colin and I, after a good start, lost to the Glovers’ pair who eventually came second and included their semi-professional, John Isaacs who, after sending our balls all over the place, proceeded to show us how to do the shot of bouncing his ball over the top of one of our balls and through the hoop. We then took on the Master Glover, Alvin Seth-Smith and his delightful Mistress, but lost after being in a leading positon but it was the Master’s birthday. Colin was under the impression that striking the ball so that it went through two hoops was equivalent to getting a hole in one at golf. When we celebrated accordingly, our behaviour was frowned upon and we were told it is not that unusual but at least Colin was able to put his drinks money back in his pocket. We were treated to an excellent lunch prepared by the Glovers with a little help from the Horners in the form my wife, Judith. Whilst we had been lunching the weather had taken quite a turn for the worse with a definite drop in temperature and a cold wind. This meant that we had to cover up our smart blue tops with the result that Heather and Andy could be seen from afar in their cool looking all white outfits gliding across the lawn carefully striking the ball through the hoops. Geoffrey and Denis continued their winning ways until they came up against the winning pair from the Coachmakers who it turned out were more semi-professionals, so no disgrace there. Geoffrey and Denis did however have a podium place coming third equal. After tea and the presentation of prizes we said our farewells and like many others who had had an enjoyable day thanked the Glovers and encouraged them to have a repeat next year. I am sure they will. The date for next year’s Tournament is Saturday 15th June 2019. If any Horner would like to participate please contact either me or our learned Clerk.